"Superfruit" redirects here. For the musical duo, see Superfruit (duo). Superfood is a marketing term for food with supposed health benefits as a result of some part of its nutritional analysis, or its overall nutrient density. The term is not commonly used by experts, dietitians and nutrition scientists, many of whom dispute that particular foods have the health benefits claimed by their advocates. In 2007, the marketing of products as "superfoods" was prohibited in the European Union unless accompanied by a specific authorized health claim supported by credible scientific research. Many new, exotic, and foreign fruits are marketed under the term, or the related term, superfruit, after being introduced or re-introduced to Western markets. Commonly cited as a superfood, blueberries actually provide moderate levels of nutrients compared to many vegetables and other fruits. The term has no official definition by regulatory authorities in major consumer markets, such as the United States Food and Drug Administration and Department of Agriculture or the European Food Safety Authority. It appears to have been first used in a Canadian newspaper in 1949 when referring to the supposed nutritional qualities of a muffin. :68 In the late 20th and early 21st centuries, the term "superfood" was used as a marketing tool for selling specific foods, dietary supplements, foods with selected food additives, and self-help books about fad diets, promising an enhancement to health. "Superfood" products were sold at a higher price than similar foods not marketed with the label. :71-71 The purported health benefits and effects of foods described as superfoods are unsupported or disputed by scientific studies. As of 2007[update], the marketing of products as superfoods was prohibited in the European Union unless accompanied by a specific authorized health claim supported by credible scientific research. The ruling was a marketing guide issued to manufacturers to assure scientific proof or evidence why a food would be labeled as extra healthy or classified as a superfood. The European Food Information Council stated that it was impractical for people to have a diet based only on superfoods when nutrients are provided readily from a diet based on a diversity of foods, especially a diet including fruits and vegetables. According to Cancer Research UK, "the term 'superfood' is really just a marketing tool, with little scientific basis to it". Although superfoods are often promoted as preventing or curing diseases, including cancer, Cancer Research UK cautioned that they "cannot substitute for a generally healthy and balanced diet". According to Catherine Collins, chief dietitian at St George's Hospital in London, the term can be harmful: "There are so many wrong ideas about superfoods that I don't know where best to begin to dismantle the whole concept." Superfruits are a subset of superfoods as first used in 2004. The designation of a fruit as a superfruit is entirely up to the product manufacturer, as the term is primarily used to create consumer demand. The Dutch food safety organization Voedingscentrum noted that the health claims marketers used to sell goji berry, hemp seed, chia seed, and wheatgrass were not scientifically proven. The organization warned that people who consumed such foods in large quantities may develop an "impaired, one-sided diet". Berries remain under research and do not have evidence of providing any health benefits different from other fresh fruits. Specifically, blueberries are not especially nutrient dense (a superfood characteristic); they have moderate content of only three essential nutrients: vitamin C, vitamin K, and manganese. In 2007, the superfoods category was forecast to become a billion dollar global industry by 2011, with several thousand new superfruit products expected to enter the marketplace. According to Datamonitor, superfruit product launches grew at a rate of 67% (2007–2008), but underwent significant category erosion beginning in 2011, when introductions of food and nonfood products featuring pomegranate, açaí or goji declined by 56% (2011–2012 vs. 2009–2010). More than a dozen industry publications on functional foods and beverages have referred to various exotic species as superfruits, with estimates for some 10,000 new product introductions in 2007–2008. Relatively rare fruits originating from Oceania (noni), China (goji, seabuckthorn), Southeast Asia (mangosteen) or tropical South America (açaí) and unknown to American consumers were among the first wave of superfruits successfully used in product manufacturing from 2005 to 2010, but their popularity declined from 2010 to 2013. However, consumer interest in new products using pomegranate remained constant during that time. Manufacturers may use some fruits to enhance the flavor of food products in an attempt to mask other tastes or provide impressions of novelty and health. Five thousand new products were introduced in 2005 based on berries alone. The superfruit category was one of the top 10 global trends in consumer products in 2008. By 2013, however, innovation in superfruit products appeared to be in decline, with fewer new introductions to the category. Over the years 2011 to 2015, however, the number of food or beverage products containing the words "superfood", "superfruit" or "supergrain" had doubled. Look up superfood in Wiktionary, the free dictionary. ^ a b c d e "The science behind superfoods: are they really super?". European Food Information Council. November 2012. Retrieved 21 October 2014. ^ a b c Fitzgerald M (2014). "It's a Bird! It's a Plane! It's Superfood!". Diet Cults: The Surprising Fallacy at the Core of Nutrition Fads and a Guide to Healthy Eating for the Rest of US. Pegasus Books. ISBN 978-1-60598-560-2. ^ di Noia, Jennifer (2014-06-05). "Defining Powerhouse Fruits and Vegetables: A Nutrient Density Approach". Preventing Chronic Disease. National Center for Chronic Disease Prevention and Health Promotion (USA). 11. doi:10.5888/pcd11.130390. ISSN 1545-1151. Retrieved 2014-06-11. 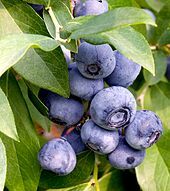 ^ a b "Nutrition facts profile for blueberries per 100 g, USDA Nutrient Tables, SR-21". Conde Nast. 2014. Retrieved 21 October 2014. ^ Brown, Amy (2010). Understanding Food: Principles and Preparation. p. 331. ISBN 978-0-538-73498-1. ^ "How 'Superfoods' Like Bulletproof Coffee Get Popular (Hint: It's Not Nutritional Science)". Healthline. January 2015. Retrieved 10 Mar 2015. ^ a b "Superfood 'ban' comes into effect". BBC News. 2007-06-28. ^ a b "'Superfoods' and cancer". Cancer Research UK. Retrieved 1 August 2013. ^ Hill, Amelia (2007-05-13). "Forget superfoods, you can't beat an apple a day". The Observer. ^ a b c d e f g h Srinivasan S (6 March 2008). "Superfruits - Bespoke for Functionality or Fad?". Frost & Sullivan Market Insight. Retrieved 29 November 2015. ^ a b c Sohn, Emily (10 March 2008). "Superfruits, super powers?". Los Angeles Times. Retrieved 23 June 2009. ^ "Amazon superfruits set to boom". Functional Ingredients. William Reed Business Media Ltd. 30 November 2006. Archived from the original on 10 May 2010. Retrieved 23 June 2009. ^ Starling, Shane (14 May 2008). "Superfruit success not grown on trees, say authors". William Reed Business Media Ltd. Retrieved 22 June 2009. ^ a b Jeroen Schutijser (6 March 2014). "Superfoods bestaan helemaal niet (in Dutch)". Nederlandse Omroep Stichting. ^ Seeram, N. P. (2008). "Berry fruits: Compositional elements, biochemical activities, and the impact of their intake on human health, performance, and disease". Journal of Agricultural and Food Chemistry. 56 (3): 627–9. doi:10.1021/jf071988k. PMID 18211023. ^ a b c McNally, Alex (10 August 2007). "Superfoods market set to double by 2011". William Reed Business Media Ltd. Retrieved 22 June 2009. ^ a b c Schardt, David (November 2006). "Super Fruit: Squeezing cold cash out of three 'hot' juices" (PDF). Nutrition Action Healthletter. Center for Science in the Public Interest: 9–11. Archived from the original (PDF) on 6 July 2009. Retrieved 23 June 2009. ^ Runestad, Todd (1 October 2007). "Functional ingredients market overview". Functional Ingredients. William Reed Business Media Ltd. Archived from the original on 5 December 2010. Retrieved 22 June 2009. ^ Halliday, Jess (23 October 2007). "Superfruit flavours get ever more exotic". William Reed Business Media Ltd. Retrieved 22 June 2009. ^ Fletcher, Anthony (31 March 2006). "Super fruits set to dominate flavour market". William Reed Business Media Ltd. Retrieved 22 June 2009. ^ "Fresh, super and organic top trends for 2008". William Reed Business Media Ltd. 28 November 2007. Retrieved 22 June 2009. ^ Rebekah Schouten (13 May 2016). "The top three trending superfoods". Food Business News, Sosland Publishing Co. Retrieved 2 April 2017.